We spent the morning touring the gardens at Shoenbrunn Castle, acres and acres of paths, statues hedges, and sculptured gardens. The gardens are open to the public and we saw lots of joggers, walkers and tourists. There is a structure on the hill above the gardens below which is a fountain that takes up about an acre. The size and proportion of these gardens was immense and hard to describe. We walked for quite a while without retracing our steps. We spent the rest of day driving from Vienna to Venice, still enjoying beautiful scenery of Italian mountains. It shouldn’t have taken all day, but halfway to Venice, the check engine light came on again, so we called the European service department. The customer service skills of the service people can use some polishing, as the woman on the phone asked Sheldon, “What have you done to the car?” We found out that there was a service station about 50 kilometers behind us in Graz where we could take the car, so we turned around and went back. When we got there, the place was closed so we waited for a while and then called the Mercedes service number again. We were told the dealer is closed because it was a bank holiday, but the service person was on the way and should arrive any time. When he arrived, he ran the diagnostics on the car and found that the car believed there had been a loss of pressure in the fuel line but there was no evidence that this had actually happened in the fuel system itself. So, we concluded that the check engine light was not a serious issue and we could carry on with our vacation and get it taken care of later. Due to the detour, we did not arrive at our hotel outside of Venice until 5:30 pm, but we found out the bus came by the hotel every 30 minutes and we could buy a bus/waterbus ticket good for 24 hours. We dropped off our bags and headed into Venice. At first, we had no idea where we wanted to go in the city, but once we arrived and started walking, Sheldon saw the signs for the Piazza San Marco and the Rialto bridge. Since we were there so late, we walked extremely fast to get to these places before dark. The light falling on the city from the sun low in the sky was beautiful, and even though I was walking fast, I still managed to take a lot of photographs of one lovely Venice scene, bridge or square after another. Once we got to Piazza San Marco, we worked our way back to the Rialto Bridge and found a cafe and had some dinner. The night was slightly chilly, but it was beautiful. During our walk through the city, we saw that the America’s Cup races were currently being held in Venice, and while we were having dinner, one of the British news crews sat next to us and we had a nice discussion with them. 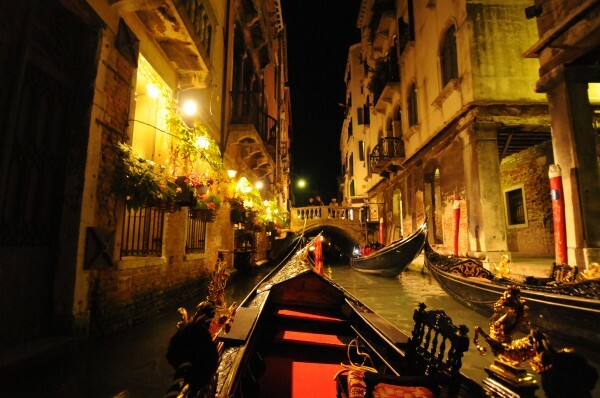 After dinner, we took a night gondola ride from the Grand Canal through some smaller canals. It was quiet and peaceful and beautiful. The gondolier would call out at intersections to make sure nobody was traveling the cross canal. We opted for the water bus ride back to the bus station and took the land bus back to the hotel.